The Special Edition range from Jané offers a touch of luxury with the very best in style and design for you and your baby. This travel systems uses only the highest quality materials and is complete with the coordinating iMatrix advanced i-Size safety car seat that turns into a lie-flat carrycot, offering you the ultimate and the most technologically advanced travel system on the market. Minnum from Jané has been designed right down to the last detail to give excellent manoeuvrability, which means you’ll be able to cope easily with whatever the city throws at you. Ultra-light aluminium chassis, with dual action brakes, front and rear suspension and Pro-Fix system to attach the seat in the forward or rearward facing position. Simple and compact folding system, height adjustable leatherette ergonomic handlebar and just 6.5 kg in weight. Not only will you have one of the most versatile pushchairs on the market, but you will be just as agile when it comes to manoeuvring it, and all with the maximum comfort and safety for your baby. Minnum Sport pushchair complete with the world’s first iSize convertible all-in-one car seat and carrycot complete with the iPlatform, the i-Size isofix car seat base for fitting the car seat in the car in seconds. 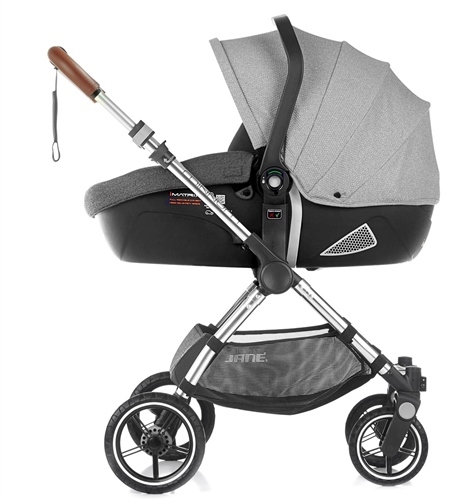 The iMatrix is fitted with the “Pro-Fix” system, which means that with just one movement, it can be fitted onto your Jané chassis to make it a unique and healthier i-Size travel system. When used on the pram chassis or separately as a carrycot it can be fully reclined to be used in the healthier 180° Lie-Flat position which is recommended by health officials. It can also be used for overnight sleeping when used with a mattress. When in the car the Pro-fix locking allows for ultra-quick installation in the car in the sitting-up position on the i-Size Isofix iPlatform base, which is included and the latest in car safety available. ● Coordinating Pram bag with changing mattress (UK). ● Minnium Special Edition is our most technologically advanced travel system with the choice of two coordinating and innovative iSize safety car seats, the latest in car safety available. ● Easy to manoeuvre thanks to the short distance between axles, ideal for the city and helps you take urban life in your stride. ● PU tyres for greater comfort on bumpy ground and are also 10 times harder wearing than normal tyres. ● Independent front and rear suspension provides a stable and comfortable ride. ● Pushchair seat is suitable from birth thanks to its fully reclinable, roomy, removable and reversible seat unit with adjustable footrest. ● Large, extendable hood for protection against the sun, wind and rain (raincover also included). ● Full height adjustable handle with an ergonomic leatherette handle grip (85-100 cm). ● Simple folding chassis is compact, light to carry and fits almost anywhere, even with the seat unit still attached. ● Ultra lightweight aluminium chassis at only 6.5 kg. ● Complete with the iMatrix i-Size car seat, a unique car seat that turns into a carrycot. Subtle leatherette and chrome detailing make it uniquely stylish. Exclusive Special Edition luxury fabrics and distinctive design details. Stylish and so on trend. Hardwearing PU Tyres, steel ball bearings, suspension and lockable swivel wheels. Suitable from birth thanks to its roomy, lie-flat, removable and reversible seat unit with adjustable footrest and extendable hood. Full height adjustable handle with an ergonomic leatherette handlebar (85-100cm). Dual action foot operated parking brake. Easy to manoeuvre thanks to the short distance between axles; ideal for the city. Ultra-lightweight aluminium chassis at only 6.5kg. PU tyres for greater comfort on bumpy ground and 10 times harder wearing than normal tyres. Dual action brakes - making the wheel lock more secure. Leathertte ergonomic handle grip and bumper bar. Simple compact folding system, even with the seat in place. Fully reclining 3 position backrest with extending hood that's suitable from birth to active toddler. Height adjustable handle (85 - 100 cm). Complies with the ECE R129 i-Size regulations. For children with a height between 40 -83 cm. Birth to 15 months. Always in the rearward facing position. iMatrix's base uses ultra-quick connectors with Pro-fix locking. Anchored to the car with isofix and a front anti-rotation leg for complete safety and reliability. This is the safest installation system, as it prevents any installation errors that could affect safety. 4 recline positions to adapt to your baby's comfort. Can be used in the 180° Lie-Flat position on the pram chassis or separately as a carrycot. Use for overnight sleeping when used with a mattress. Pro-fix: locks and unlocks the car seat from its base and any Jané chassis with just one movement. Fitted with "memory foam" for maximum dissipation of loads in the event of a side impact. Adjustable headrest means the baby's head is in a better position when sitting up and increases the interior space of the baby carrier. Complete with adjustable hood and apron to protect baby from the sun and wind and creates a cosy environment for rest and sleep. NOTE: iMatrix i-Size / Matrix Light 2 main differences. As the iMatrix is an i-Size car seat it means, like all i-size car seats, that it uses the ISOFIX system and not seat belts to install into your car. Also the lie-flat functionality is limited to the pram and carrycot modes, and not available in the car. If you wish to have the option of seat belt installation and the lie-flat position when in the car, then you would need to look at the MATRIX LIGHT 2 version travel systems. The world's first i-Size convertible all-in-one car seat and carrycot. Complies with the new i-Size (R129) standards, the latest in car safety standard. iMatrix has greatly improved safety performance and protection for baby's head and neck with new high impact-absorbing material, new-born insert head protector and built-in side impact protection. Independently adjustable hood and carrying handle with an ergonomic handle grip. Removable hood and apron to transform your iMatrix into a carrycot and pram. The 180° lie-flat mode is available when used as a pram or carrycot, and not in the car. Simultaneous safety harness and headrest adjustment. Adjust the headrest to the correct height for your baby and the harness height also adjusts automatically, increasing safety. The stunning special edition Minnum chrome chassis is robust and ready for whatever the city throws at you. Nothing goes amiss, even right down to the large detailed shopping basket. This Special Edition Minnum features subtle neutral tones contrasting with chrome and leatherette details. This travel system is ideal! It has it all! I've had so many different buggys over the years and this is the best by far! I love the fact that the car seat is so multifunctional! The whole thing just feels so solid and of great quality! The seat is comfy and is well padded, very easy to click on and off. Big enough to fit my two and a half year old little boy so I know it'll last when I have my baby.. we r not using it yet as baby isn't born yet, but had plenty of playing around with it! The colour is so eye catching and unisex! I know that no one else will have the same pram! Suspension is quite good and the basket is large enough for the changing bag and other bits. Love the fact that the handle goes up high enough for taller people. Easy to fold as well. We haven't tried the isofix yet but really looking forward to it! Can't wait to have my baby girl and start using it! Oh we also purchased the sport wheels kit, just in case we decide to go for a forest walk or something. Tried them on and the buggy looks great either way! I wish I had it when I had my son!